Apple’s new Mac Pro, the company’s latest “fastest Mac ever,” has been beefed up not only with faster, more-efficient processors, but also with a broad range of under-the-hood improvements designed to provide the eight cores in those processors with plenty of data to chew on. The new Mac Pros are truly wonderful machines—strong and silent. A faster system bus and faster memory make them far and away better and more cost-effective professional content machines than anything else on the market. According to our Speedmark benchmark test, the performance of the new Eight-Core 2.8GHz model is similar to the much more expensive previous-generation eight-core 3GHz Mac Pro. And one of the base model’s most attractive features is that it’s just that: a great base upon which to build a truly fearsome-fast machine. If you’re a multimedia pro—videographer, professional photographer, or audio pro—the Mac Pro is the machine you want to use. Just make sure that you build upon its sturdy base the configuration that best fits the tasks you want to perform. Successful computer design is all about balance. Memory must be able to keep up with processors, storage must rapidly fulfill data requests, and expansion slots must swiftly supply displays and drives with pixels and bits. The new Eight-Core 2.8GHz Mac Pro sports enhancements in all of these areas. However, to reap the benefit of the storage improvements, it’ll cost you extra for an optional RAID card ($800) and speedy SAS (serial-attached SCSI—$1,450 for two) drives—but the extra cost may be worth it, depending on your needs. Note that these upgrades alone approach the price of the base system, and that we have not tested this configuration. The two Intel Xeon Harpertown processors that lie at the heart of the new Mac Pro are voracious beasts. With each processor carrying four processing cores, their architecture is essentially the same as that of the previous Mac Pro’s Cloverton processors (we have to wait until later this year for the next entirely new Intel architecture, code-named Nehalem, to appear). Meanwhile, they benefit from a few key improvements. For example, in addition to their improved 45-nanometer efficiency, their on-chip caches have been boosted to 12MB per each quad-core processor, allowing for near-instantaneous access to a larger amount of frequently used data and instructions. They also benefit from a new set of instructions called SSE4, which can improve everything from video encoding to gaming to database searching. The processors also talk to the rest of the Mac Pro more quickly, over a new 1600MHz frontside bus that communicates with faster 800MHz memory through a faster Intel Seaburg system controller. According to Apple, that makes memory throughput over one and a half times as fast as the earlier Mac Pro line. So how does this translate into real-world performance? In our Speedmark benchmark tests, the new 2.8GHz Mac Pro scored 22 percent higher than the older 2.66GHz Mac Pro. In certain tests—Cinema 4D and Compressor—the new 2.8GHz showed an even more impressive performance advantage, with the new model completing those tests about 75 percent faster than the old model. Comparing the new eight-core 2.8GHz Mac Pro results to the older eight-core 3GHz Mac Pro, the new model is faster in half of the tests. Unsurprisingly, the older 3GHz Mac Pro ( ) had a higher Speedmark score (317) than the new 2.8GHz model (314), but not by much. A 3GHz version of the new Harpertown processor is still available as an $800 build to order option, but while the 3GHz was the top of the line last year, the new batch of Mac Pros now offers, for an additional $1,600, dual 3.2GHz processors for the truly power hungry. As it stands, the new eight-core 3GHz system’s Speedmark score was about four percent higher than the new eight-core 2.8GHz model, clocking in at 13 percent faster in the Compressor test and 18 percent faster in the Photoshop test, and about 3 percent faster than the old 3GHz model. Alternately, the new four-core 2.8GHz system was about 6 percent slower than the new eight-core 2.8GHz machine in our Speedmark test, and though these two machines performed almost on par in certain tests, the results for Cinema 4D and Compressor were 63 percent slower and 33 percent slower respectively for the 4-core machine. Perhaps one reason why the muscular eight cores of the new 2.8GHz base configuration did not perform as well as the specifications suggest was the pokey single 320GB hard drive and a paltry 2GB of RAM. For example, even when performing various combinations of intensive operations such as encoding a DV file using Compressor 3, and running a processor-pounding set of Photoshop CS3 Actions, Activity Monitor indicated that the Mac Pro’s processors were using—at best—only about 60 percent of their full power. It seems that the single drive and meager RAM just couldn’t feed them data fast enough. That conclusion makes sense, but based on a battery of follow-up tests, it may not tell the whole story. Cinema 4D, part of our Speedmark testing suite, is engineered to use multicore machines efficiently. Thus, our video test with this software facilitated peak processor performance—more than 90 percent of capacity. Most applications—even Apple’s own Final Cut Pro (in its default configuration)—do not have such efficient multicore capabilities. In order to achieve peak performance in all eight processors with Final Cut, we had to enable its companion Qmaster software to share the processing activity across all eight cores. In default mode, without Qmaster, the processors were indeed operating at about 60 percent of their capability. This tells us that despite the hardware’s inherent power, how well your applications can take advantage of multiple cores will play a big part in determining how well your Mac Pro performs. In some instances, a single quad core 2.8GHz Mac Pro might do the job you want just as well for hundreds of dollars less than you’d pay for the new 8-core model. The moral of the story: There’s no way for you to control how software companies engineer their products, but RAM and storage are things that you can control. If you want to do high-end work (such as multi-stream Final Cut Pro HD or multi-track Logic projects), you’ll need more than 2GB of RAM and a 320GB drive. 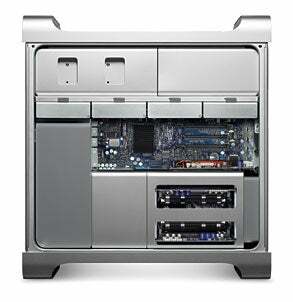 But that may be the most influence you’ll get over the Mac Pro’s processor speed and efficiency. The new Mac Pro’s faster system controller connects to the unit’s new—and faster—PCI Express 2.0 expansion slots. Not only do they provide double the throughput of the original PCI Express, they also offer better control over the devices you’ll pop into those slots. The Mac Pro has a total of four PCI Express slots: The top two are plain vanilla PCI Express, the bottom two are the more-robust PCI Express 2.0. Unlike the earlier Mac Pros, in which you could have only one 16-lane card and had to use the Expansion Slot Utility to choose that lucky slot, this new configuration provides full 16-lane support in both bottom slots; both upper slots support four-lane cards. Into the bottommost slot—which is double-wide, should you choose to fill it with an exceptionally chubby video card—goes your choice of an ATI Radeon HD 2600 XT 256MB (base model), NVIDIA GeForce 8800 GT 512MB (a $200 premium), or NVIDIA Quadro FX 5600 1.5GB (a whopping extra $2,850). Each of these cards has two dual-link DVI ports to support two 30-inch Apple Cinema Displays. The Radeon and GeForce cards also use what’s called a unified shader model, which allows developers to more easily make their games and 3-D applications perform better. The Radeon HD 2600 XT is a perfectly fine card, but if you’re into gaming or 3-D modeling, or use Aperture ( ) to view hefty images, consider the GeForce 8800 GT—Aperture is smart enough to let that card’s GPU help push pixels onto your display, and more apps are sure to follow. Although we haven’t yet tested the GeForce 8800 GT, word on the street is that it’s a screamer—and seeing as how it has nearly three times the memory bandwidth as the Radeon HD 2600 XT and can process a cool 24 times as many textured triangles per second, we have no reason to doubt the common wisdom. Finally, unless you’re a scientific or CAD type who needs the Quadro FX 5600’s huge 1.5GB frame buffer or Stereo 3-D trickery, save your money. The 2.8GHz model that we tested didn’t have the Mac Pro’s new—but optional—storage improvements. As in previous Mac Pros, the new model has four easy-to-access storage bays into which you can insert up to four 7,200rpm SATA drives of up to 1TB each. What’s new is that you can now replace those drives with up to four exceptionally speedy 15,000 rpm SAS (serial-attached SCSI) 300GB drives inserted into those same bays ($650 for the first, $800 each for the next three), then disconnect one simple cable from the logic board, reconnect it to an $800 Apple Pro RAID Card you put into the top PCI Express slot, and, should you so choose, boot from the first SAS drive and configure the other three into a fast, safe, RAID 5 array. Other RAID configurations are possible, as well. The Apple Pro RAID Card has a couple of more tricks up its sleeve. For example, it has 256MB of onboard cache (with a 72-hour battery backup) that not only enhances RAID performance, but can also speed up the performance of individual drives when you configure them in what Apple calls Enhanced JBOD mode—JBOD being the nerd-standard term for Just a Bunch of Disks (seriously). The card also manages all your drives’ metadata header, so that if you start out with them configured as a JBOD and later want to promote them to a RAID 1 or RAID 5, you can do so without losing any data—just reconfigure them using the card’s simple setup utility. Slick. If you simply want the fastest Mac you’ve ever used, the base-model Mac Pro Eight-Core 2.8GHz won’t disappoint. If you’re a content-creating professional who needs your video, audio, and or imaging workstation to fulfill its true potential, you may also opt to spend the extra cash to upgrade your new Mac Pro’s processor speed, storage and RAM. If, however, you don’t need the maximum Mac, stick to an iMac—they’re plenty powerful for the rest of us.